For many years, I was petrified of birds. Seems silly, right? Well, that is because you weren’t there that day (unless your name is Sheryl). It was during my late elementary school years. My best friend and I were riding our bikes around the neighborhood like we had done numerous times before. You see, I lived at the top of a large hill (or so it seems when you are 9 years old). We enjoyed free-riding down the hill, on the street, to see how fast we could go down. Once you got down though, you had to pedal your way back up. On this specific day, I was tired. We had gone down the hill, across the street, through the park area, and back across the street before trying to go back up the hill again. I told Sheryl that I needed a break and she wanted to keep going. This ugly, wet, squawking bird came flapping right in front of my groin area! I immediately dropped by bike and ran off screaming. I honestly think this bird was possessed, by what, I don’t know. That son of a feather squawked as it chased me up the hill. I don’t remember how I finally got it to leave me alone, but boy did Sheryl think it was comical. She was laughing so hard! I had to go back for my bike, though, I really just wanted to leave it there forever. From that point until the last few years, I have loathed birds. My parents had birds. If the birds were out of the cage, I was in my room with the door closed and a towel shoved in the bottom crack (you know, just in case). Everytime a bird came near me, I felt like I was going to panic. I couldn’t be near them. This made going outside particularly difficult. Anything with wings and a beak was not okay including swans and ducks. Looking back, I see how silly I must have seemed to those who didn’t witness my bird traumatizing event. I would flinch everytime one got close to me. Now, 95% of the time I don’t even think twice about it. 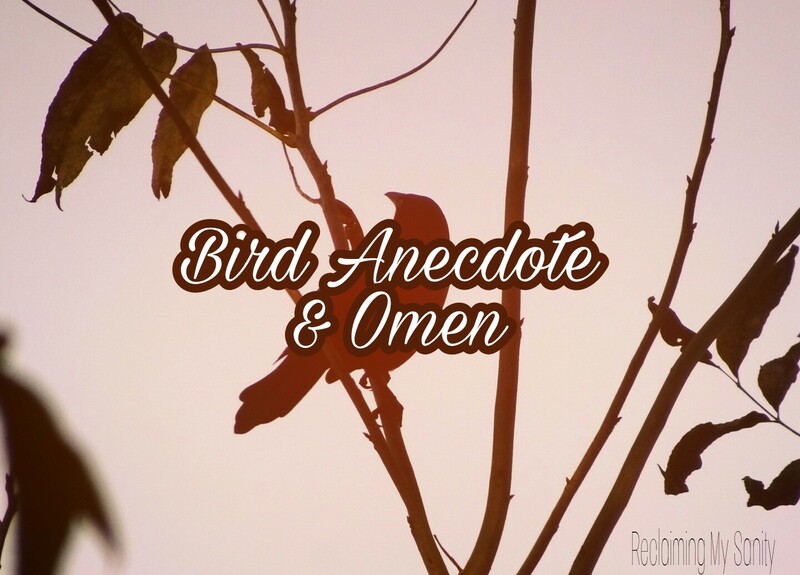 As I was typing this I recalled reading about omens on another blog (my memory is failing on who’s that was). I just decided to Google bird omens. According to multiple sources, birds are omens for good luck and protection. I certainly felt the complete opposite of those two things during the encounter. Perhaps it was the birds first day at omen-ing. Or perhaps that bird was just possessed by something insane and wanted to peck me alive. Your writing ability is a gift from God. I hope to read your novels in the future. Thank you so much! I appreciate such kind words! I have thought about writing novels for awhile now. It is on my goal list. I am also wanting to write children’s books. It just comes down to actually doing it!